Bones give the human body structure and support, much the same way that the beams of a house support and form the walls and roof of a house. Long bones -- a subtype of bones -- are longer than they are wide. These are strong bones because they must be able to withstand the force generated when the body moves and changes direction. Though different long bones have different shapes and functions, they all have the same general structure. Examples of long bones include the femur, tibia, radius and ulna. Every long bone is capped with wide areas on each end which are called epiphyses. The epyphisis closer to the torso is called the proximal epiphysis while the distal epiphysis is at the farther end. Epiphyses are filled with spongy bone containing red bone marrow, which is red in color because it makes red blood cells. Each epiphysis is capped with articular cartilage that connects the bone to the rest of the body while simultaneously cushioning the end of the bone. The largest part of any long bone is the long cylindrical middle, called the diaphysis. The diaphysis takes the brunt of the force a long bone must support, and is made up primarily of compact bone -- a dense, strong bone composed of minerals, including calcium, phosphorus and magnesium, as hard as many types of rock. The diaphysis also has small holes for blood vessels that carry nutrients to the compact bone cells. Between the ephiphysis cap and the long shaft of the diaphysis is a wide section of bone called the metaphysis. The metaphysis transfers load and stress from the joints at the ephphysis into the longer and stronger diaphysis. The metaphyses are also important for bone growth during childhood and adolescence. They make up part of the growth plate, and during childhood, cells in the metaphysis divide for longitudinal bone growth. Long bones all have a long cavity inside the diaphysis called the medullary cavity. This cavity is filled with red bone marrow in children, which transitions to yellow bone marrow as they grow to become adults. For this reason the medullary cavity is also called the marrow cavity. The yellow bone marrow in the medullary cavity looks yellow because it contains fat cells. The marrow contained in the cavity gives rise to several cell types, including cartilage, fat, bone and blood cells. Brick, Beverlee. 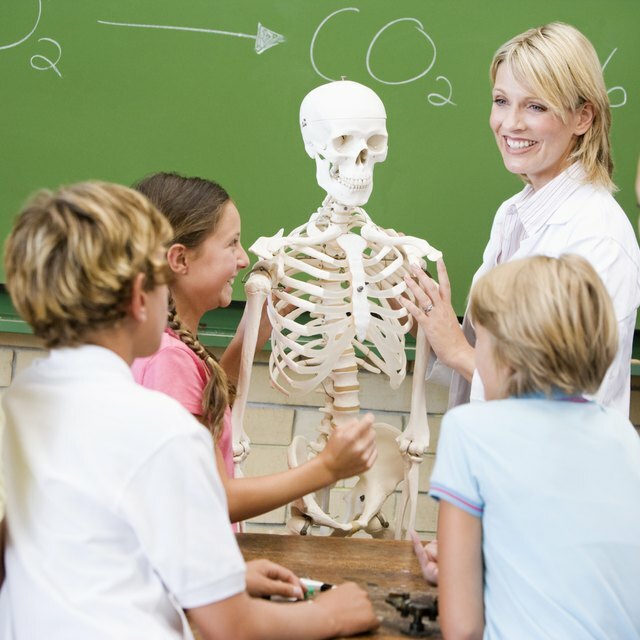 "What Are the Structural Parts of the Long Bones in the Body?" Sciencing, https://sciencing.com/structural-parts-long-bones-body-22759.html. 23 April 2018.